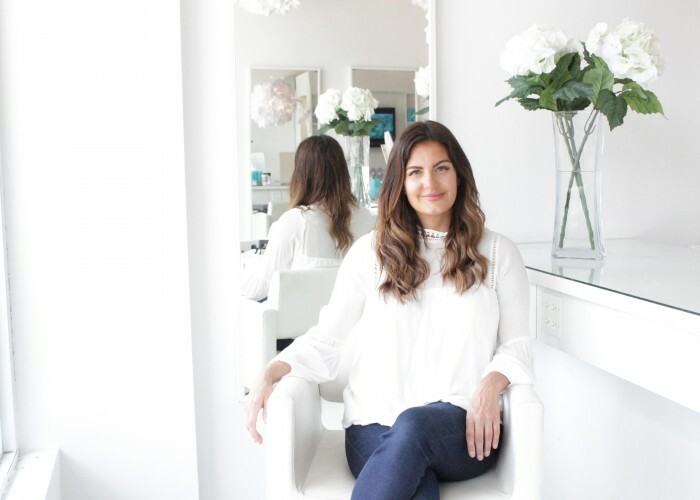 Hairstylist and hair extension-guru Melissa McKenzie has fused her way into the hair-care industry and continues to style a lasting impression on her clients. It all started with Melissa's trips with her mother to the salon as a child. "The girl who did her hair was so beautiful and she always wore dresses and was in heals. It glamourized hairdressing for me." That feeling stuck with Melissa. As glamourized as hairdressing is, she also learned there is practicality, versatility and adaptability in the industry. 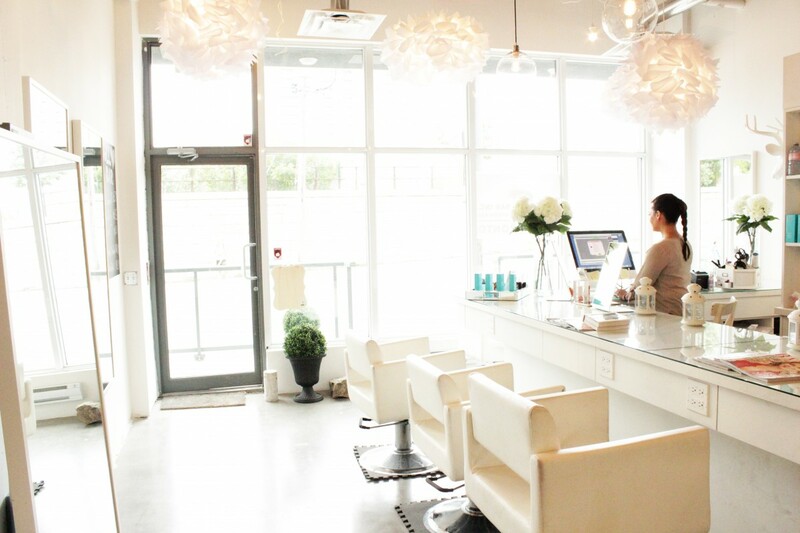 Hair extension guru, Melissa McKenzie sitting in Doll Bar Inc.'s bright salon on Queen West. Photo by Nicole Aggelonitis. What she now considers a blessing in disguise, Melissa was never able to grow out her hair, and envied those who had long, thick hair. 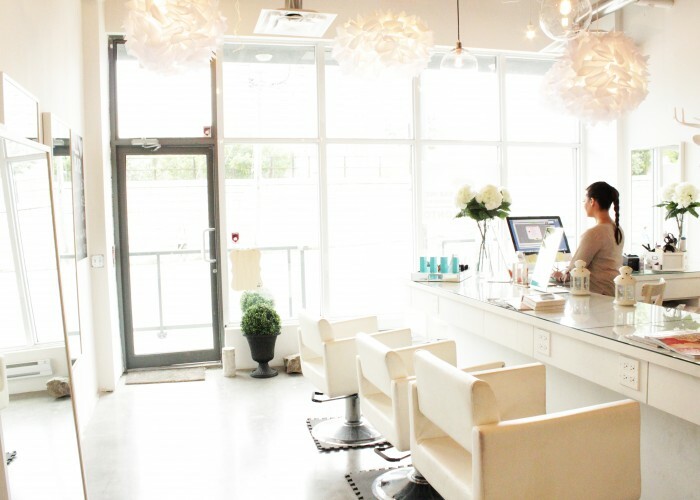 Melissa opened Doll Bar Inc. in 2011 with the vision of having a salon that exclusively offered hair extensions – similar in nature to wax bars and nail bars. She loves the illusion of hair extensions and the instant transformation she’s able to provide for her clients. When you think Doll Bar, Melissa wants you to think classy. “Years ago, hair extensions weren't synonymous with that word.” The first celebrities to admit they wore hair extensions were Paris Hilton and Jessica Simpson, and their ‘coming out’ nearly a decade ago changed the industry forever. As time went on, hair extensions became more and more popular and accessible. Doll Bar took notice and opened its doors at Queen Street West and Dufferin to occupy this niche. The salon offers a menu of specialized hair extensions services with options like full head fusion hair extensions and custom clip-ins that are always in demand. Melissa also offers fast food packages – maybe the only type of fast food you can indulge in without adding an inch to your body. She coined this term to describe ready-made, synthetic clip-Ins and hair halos in staple colours. These packages are perfect for clients in need of extra finesse and wanting something semi-permanent. Hairstylist and Owner, Melissa McKenzie front and centre behind the bar. Photo by Nicole Aggelonitis. Adorable menu sign of Doll Bar Inc.'s services. Photo by Nicole Aggelonitis. Walking into Doll Bar Inc., you would never guess the space was originally a cement block. Melissa wholeheartedly transformed the space, which is now full of personality and sprinkled with pops of vibrant colour. 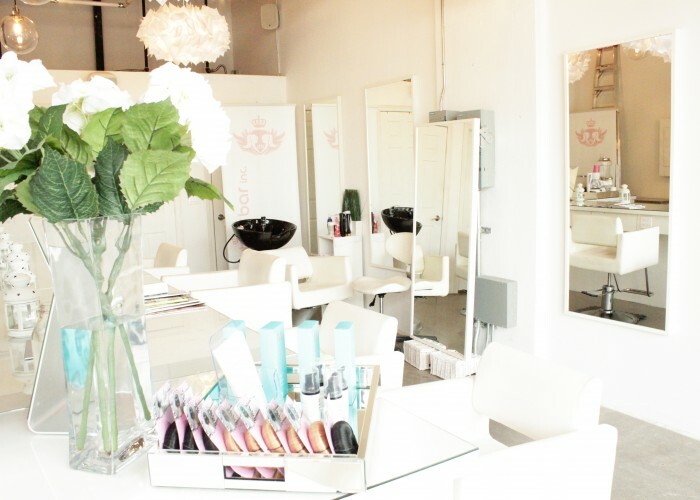 The crisp white walls with long vertical mirrors around the perimeter of the space are essential to the relaxed environment of the salon. Instead of facing the mirror, her clients sit at the glass countertop bar and can truly decompress with a cappuccino in one hand and a magazine in the other. As Melissa explains, "the warmest place in any house is a kitchen. I wanted to create that feeling of warmth at Doll Bar with the bar-style of seating." And since, for Melissa, it's all about creating a fun experience for her clientele, she makes sure to always give them the spin in their chair at the end of the appointment. Because after all, who doesn’t like to be spun around for the grand reveal? 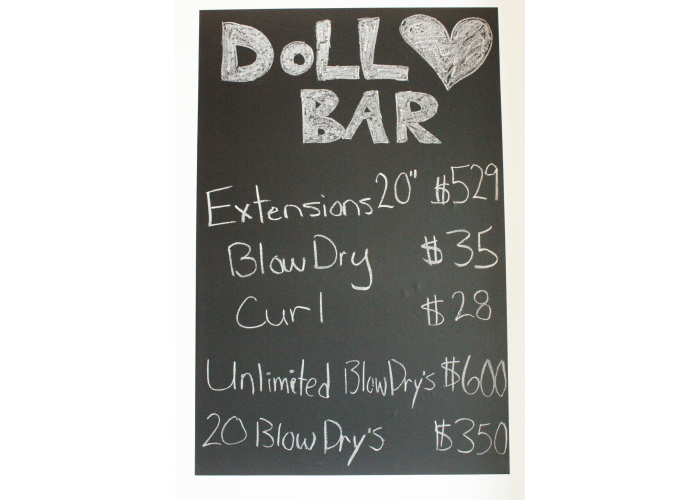 Doll Bar Inc.'s inviting hair salon. Photo by Nicole Aggelonitis. Doll Bar Inc.'s shampoo area and side bar. Photo by Nicole Aggelonitis.